You are here: Home » Freebies » Soap Nuts – the amazing natural cleaner! Soap Nuts – the amazing natural cleaner! We are all so used to highly branded products, where brand awareness is left with the enormous companies and their equally enormous marketing budgets to boot, that when you get new products trying to break into the market it has to be such an uphill struggle!. So when I was asked to try products from a local Hove based company GreenFrog, who’s ethos is different, the product is different and something that I myself have been looking for for a long time, I was very excited! When I was pregnant with my first I just didn’t want to use any chemical cleaners as I had heard that harsh chemicals were harmful to your unborn fetus and so searched for non-chemical alternatives ( or I just didn’t clean!) I really could have done with having Greenfrog products around then! With any new products, I, like other people (I imagine) would approach with some degree of caution and many questions run through your head. SO I naturally needed to find out what are Soap Nuts? 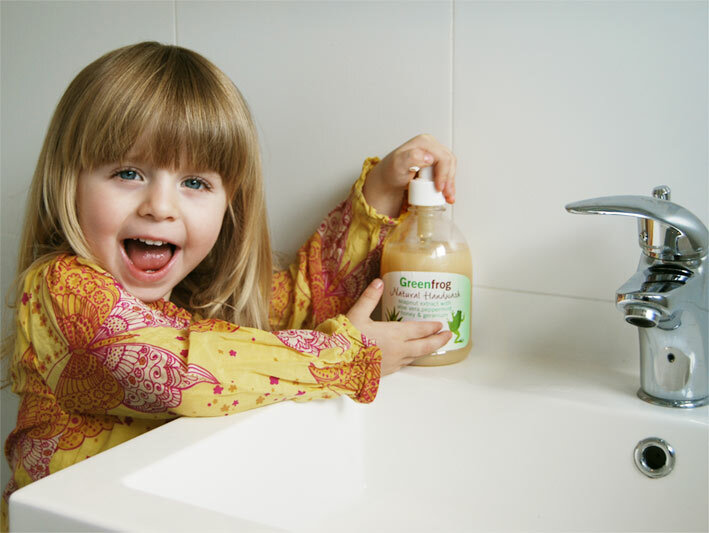 ( the main ingredient of Green Frog Products), what properties do they contain and are they safe for children? ‘Soap Nuts’ are the fruit of the Sapindus Mukorossi tree, grown for centuries in the Himalayan foothills. Soap Nuts contain large quantities of Saponin in their shells, which acts as a natural, gentle detergent when it comes into contact with water. Had a lovely clean, fresh smell, which lasts once the surface has been cleaned. It also foamed nicely which I wasn’t expecting. It tackled the Bathroom sink well, so I tried it on the shower. It did ok but for those very stubborn hard water limescale marks on chrome it didn’t cut the mustard. I did leave it on for a while, it took off some marks but it couldn’t eradicate all. I would say this is very good for every day use. I then tried the Kitchen sink and was impressed with the results, cleaned nicely, removed tea stains & general kitchen mess and if it can handle my kitchen it can pretty much handle anything! I also used it on my bathroom mirror and it was much better than my usual brand cleaner as that normally leaves a white residue. It has a gorgeous smell and left my hands feeling so soft, even after only a couple of uses. Would definitely get this again. Good sized bottle with nice and thick soap. Already my hands are looking and feeling softer, such a dramatic difference from the ravaged, dry hands I had before! I was sceptical at first due to the pre-conditioning to well known brands. It did foam but the bubbles didn’t last long and so added to my pre-conditioned response that lots of bubbles get things clean. However still trying to force those adverts out of my head, I gave it a tough test and tried it on a nice greasy butter dish. I was really pleasantly surprised and it did the job exceptionally well! No greasy residue that you can get from butter, clean as a whistle! together with that lovely smell. I have read that its the dreaded SLS ( Sodium Lauryl Sulphate) in products that makes things bubble so not bubbling is a good sign! I think I’ve used the same well known brand of laundry liquid since I moved out of the family home all those years ago! so to try something knew to wash my smalls was a big deal to me! I also carried out a handwash test with my ‘delicates’ by using a few nuts in hot water and carrying out the process as I would normally. I left them to soak and rinsing as usual I had clean, fresh washing! 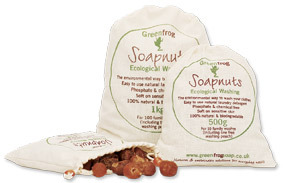 Soapnuts – from £4 for 250g bag (Ive been advised that this is enough for 50 good-sized family washes). 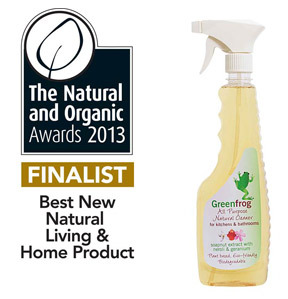 Greenfrog products are organic, sustainable, biodegradable & hypo-allergenic. I absolutely love the smell. I think my fave product has to be the handwash. If this was available in mainstream supermarkets I would definitely regularly pick this up over my usual brand named products. All the products I’ve reviewed here can be purchased from: Infinity Foods, Tree of Life, Lakeland, The Health Store and Natures Health Box. 1 Comments: "Soap Nuts – the amazing natural cleaner!"